Serbian citizens are set to rally on the streets almost daily in the coming week, both those unhappy with the state of affairs in the Balkan country and those who just want to show support for visiting Russian President Vladimir Putin. EURACTIV Serbia reports. 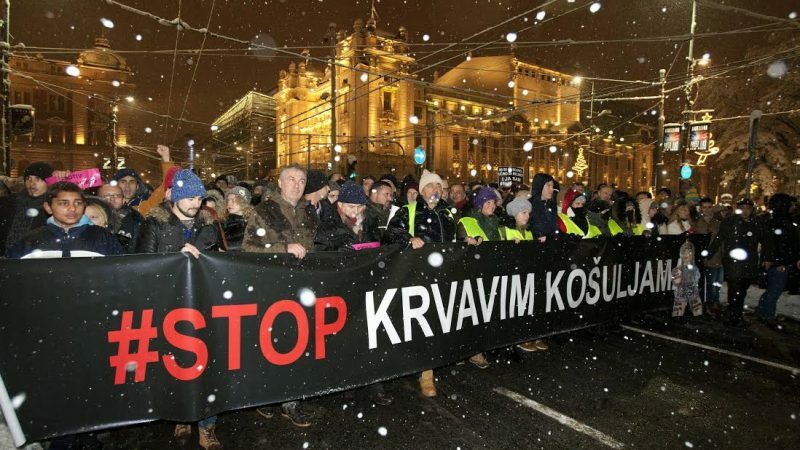 On Wednesday (16 January), protesters will gather in Belgrade once again to demand that the murderers of Kosovo Serb politician Oliver Ivanović, shot dead in the former Serbian province on 16 January 2018, be found. On Thursday, another march will be held in support of Putin’s arrival in Belgrade. The previous weekend, Belgrade saw the sixth consecutive civil protest held under the slogans Stop to Bloody Shirts and One of Five Million, continuing demonstrations that started in December after an attack on an opposition leader and two other activists in the central Serbian town of Kragujevac. The first protest rally took place under the slogan Stop to Bloody Shirts, referring to the blood-soaked shirt of Borko Stefanović, leader of the Serbian Left, who was hit on the head with a metal bar by unknown assailants ahead of a party rally. 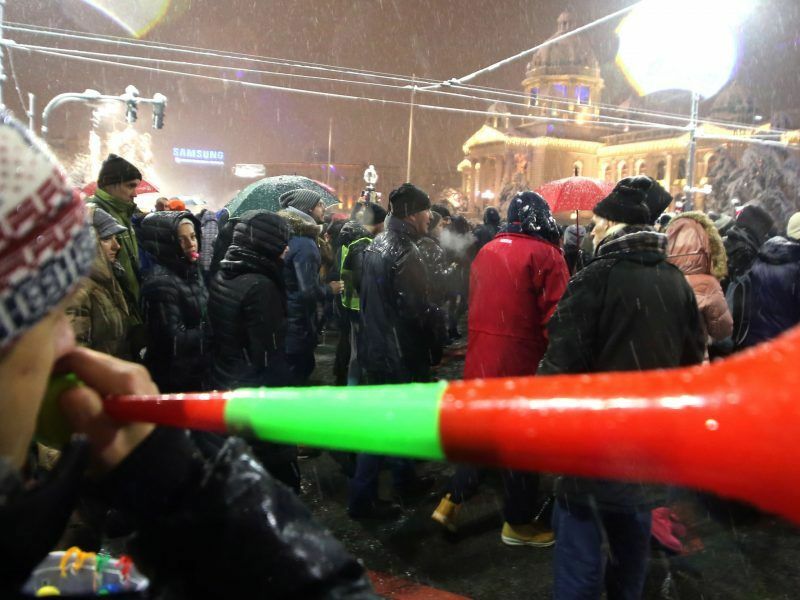 Thousands of demonstrators defied heavy snow Saturday (15 December) in Belgrade to protest what they say is a crackdown by the government of President Aleksandar Vučić on opposition parties and the media. The protesters demanded that the authorities cease violence against political opponents and find those who had ordered the assault on Stefanović. Stefanović is also one of the founders of the Alliance for Serbia, the strongest opposition bloc in Serbia. Another protest slogan soon sprang up – One in Five Million – after President Aleksandar Vučić’s statement that he would not accept the demonstrators’ demands even if there were five million of them. In response to the protests, which have been growing in strength and have meanwhile spread to Niš, Kragujevac and other Serbian cities and towns, Vučić offered a snap election, even though the protesters had not asked for it. According to some announcements, the election might be held as early as this spring. The protest is organised by citizens and public figures. Opposition parties are also taking part but without any party insignia. Estimates of the number of people taking to the streets vary from several thousand to several tens of thousands, with the authorities and pro-government media aiming to minimise it in every way. In the meantime, the list of demands has grown longer. It includes objective reporting by the Serbian state broadcaster RTS (including reports on the protests), the dismissal of the RTS general manager and news editor, full investigation of Oliver Ivanović’s murder and the interior minister’s resignation. The latest rally also put forward a demand pertaining to Kosovo, “the mother of all issues” for Serbia, which refuses to recognise its former province’s independence, declared in 2008. FIve EU countries also don’t recognise Kosovo. Reaching an extensive agreement with Kosovo is one of the key requisites for Serbia’s progress on the road to EU membership. In a press release, the protest organisers asked the Serbian president to present his plan for Kosovo, “if he has one”. Vučić’s response, quoted by the media, was that it was “so stupid” that it had left him speechless. The next One of Five Million gathering is scheduled for Wednesday, the first anniversary of Oliver Ivanović’s murder, as his killer (s) remain at large. The following day, Russia’s Vladimir Putin will arrive in Belgrade and a march in his support will be organised by a little-known organisation called the Centre for the Development of Belgrade. It is seen by some as a counter-rally by the ruling Serbian Progressive Party. The authorities have denied any links with the rally but have invited citizens to turn out in as large numbers as possible to greet the presidents of Russia and Serbia outside the biggest Orthodox church in the Balkans, the Church of Saint Sava. The organisers say Putin is expected to address the crowd. During Putin’s visit, some 20 agreements worth several hundred million euros will be signed, including deals in the energy, transport and education sectors.